Pain Physicians NY (Brooklyn, Queens, Manhattan, Bronx NYC) is one of the first practices in New York to offer Platelet Rich Plasma (PRP) Injections for patients suffering with Knee Pain. We provide effective Medial Collateral Ligament injury treatment including advanced rehabilitation therapy and surgery if required. Our facility equipped with the most advanced, cutting edge equipment to treat pain. The medial collateral ligament (MCL) is a relatively thin band of ligament passing over the knee along the inside of the leg. It is found opposite the lateral collateral ligament (LCL) that runs along the outside of the knee, and together they provide support to the knee. The MCL (medial collateral ligament) connects the inside of the bottom of the femur (thighbone) with the top of the fibula (shinbone). It also prevents the knee joint from moving in abnormal angles which would otherwise damage other parts of the knee. How the injury of the MCL occurs? The MCL (medial collateral ligament) injury is the most common knee ligament injury, usually resulting from a trauma. However, it is impossible to get accurate statistics because the symptoms and severity vary widely from one person to the other. The injury occurs when the outside of the knee is hit directly, because the force is transferred to the MCL (medial collateral ligament). The MCL in turn gets stretched abnormally which can cause it to strain, or to tear if the force was large enough. Besides trauma, abnormal valgus angulations of the knee, which the MCL prevents, can have a similar effect. These movements are often due to making quick turns on your feet such as while playing basketball or football. Less common, although possible, MCL injuries can still be the result of overuse, constantly straining the ligament can lead to sprains and injury. Grade 2 – a partially torn of the ligament. Certain instability of the knee joint occurs. Grade 3 – a complete torn of the ligament. It is the most severe type of medial collateral ligament injury. Knee joint instability is common. 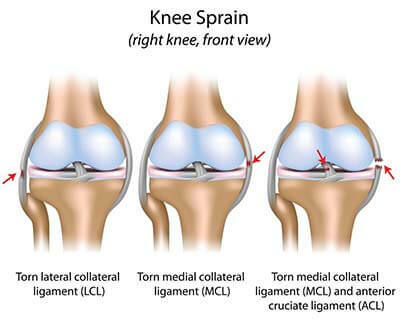 The Medial collateral ligament (MCL) is quite different from the LCL, in that it has a more complicated structure consisting of both superficial and deep components. As a result, symptoms may vary depending on which component is more affected, and so will the treatment options. Besides the affected region, severity of the symptoms will not always be consistent in everyone but will vary with the reason for the injury and the severity. These injuries are rarely serious, and even often go unnoticed. In fact, it only requires a keen observation and assessment of the symptoms to establish the cause. A trained doctor can identify the injury even quicker by observation, but may request X-rays or MRI scans if the symptoms seem severe. Treatment options mostly involve resting the affected knee and perhaps taking pain relievers to provide some comfort. Applying ice as well as elevating your knee will help reduce the swelling. Compressing the injured knee with elastic bandages or braces is also recommended. Resting your knee for a couple of days will speed up your recovery and get you back to your daily life and usual activities with minimal downtime. In cases of severe injuries, crutches are also recommended in order to keep your weight off the injured knee and help it recover faster. Rehabilitation Therapy is very important in these kinds of injuries, especially in cases when the ligaments are particularly or completely torn. Physical therapy is recommended to strengthen your leg muscles. Surgery is also recommended in severe injuries when the meniscus is completely torn, as it can’t repair on its own. In these cases MCL injuries are also accompanied with injuries of the other structures of the knee joint. The outlook of Medial collateral ligament (MCL) injuries depend from its severity. Grade 1 MCL injuries are minor injuries with a great result and quick healing. Grade 2 MCL injuries may require a treatment for up to four weeks, while grade 3 MCL injuries usually require about 8 weeks or more to heal. The most advanced pain management center, Brooklyn pain management doctors and specialists at Pain Physicians NY offer unique, individualized approach to manage your Medial collateral ligament (MCL) knee pain injury. We are using the most effective pain management options including Platelet Rich Plasma (PRP) and Corticosteroid Injections and utilizing the latest technologies available in USA.